One of the two prominent lakes in Yangon, Kandawgyi Lake translates to “great royal lake” and was created during British colonial times. Located just north of congested and bustling downtown Yangon (Rangoon), it’s a place to shed the anxiety of traffic and ease earache from horns with a walk through the surrounded tree-filled park. 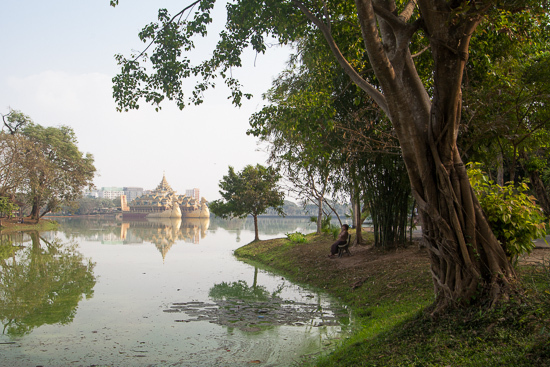 The well-kept gardens and grassed grounds are a great spot for a picnic, offering a clear, tree-framed view of Shwedagon and its reflection off the water. Karaweik Hall watches the afternoon naps. On the eastern shore, you can see two massive golden birds that carry Karaweik Hall on their back. 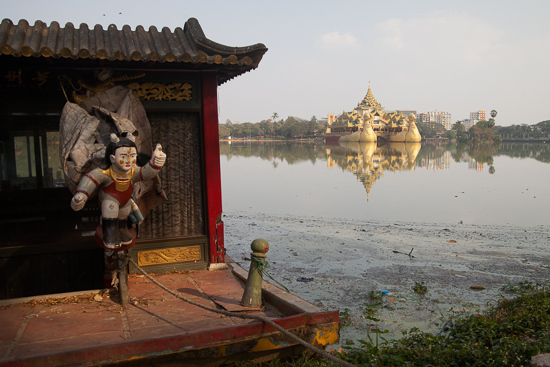 Built in 1974, this replica of Pyi Gyi Mon’s royal barge is a nod to a history when Burmese kings would travel the land being pulled in glamorous style via multiple boats up and down stream. (A still-working, original barge that is used for festivals can be seen in the northern part of Myanmar (Burma) at Inle Lake.) The Karaweiks on Kandawgyi Lake, as impressive as they are, are only used as a foundation for an overpriced restaurant and theatre stage, where nightly entertainment such as dancing in traditional costumes and puppet shows are held. Sunset is the best time for taking photos. If your wallet doesn’t match your hunger for the experience of Karaweik Hall, other restaurants and cafes sit on the eastern shore, with a 300 kyat entrance fee and views of the lake. 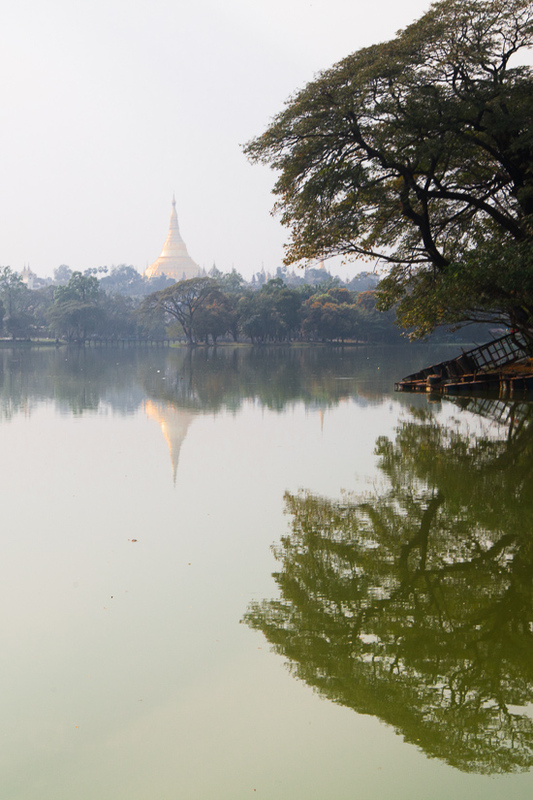 The boardwalk along the south of the lake, with an entrance fee of 2,000 kyat, gives you a clear view of Shwedagon, complete with full reflection off the lake. During the day the path can give you respite from the heat; the evening brings out the spectacular colours of Shwedagon Pagoda and local life; and you can enjoy a cup of coffee or beer at any time at upscale restaurant, Signature, located on the west side on Bahan Road. Thumbs up from the floating Chinese restaurant. Those on a tight schedule won’t miss much by skipping Kandawgyi Lake, but if you’re after some downtime from the city’s hassles, it’s two kilometres from town or less than a kilometre from Shwedagon. The walk might be a bit long for some, but the streets from the lake that lead into Shwedagon Pagoda’s east entrance are some of the most decorated and vibrant in central Yangon. It’s more peaceful than People’s Park, which is more family oriented, but can also be the centre of attention during the festivals, most notably in November when the teams from all around the country come to compete in boat races.